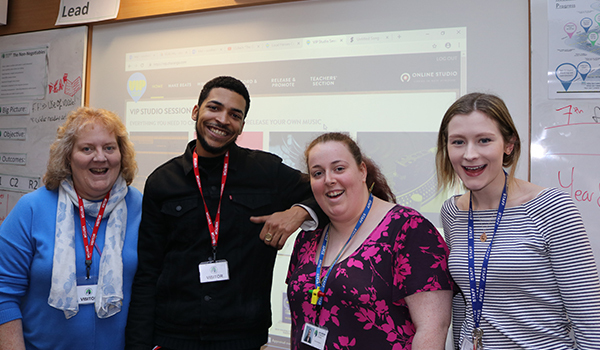 Last month Charanga’s VIP Studio Sessions and rapper Eyez took their tour to schools in Derby, funded by Derbyshire Music Education Hub. Successful events were delivered to the following schools: Allestree Woodlands School, Merrill Academy, Da Vinci Academy and Lees Brook Community School. 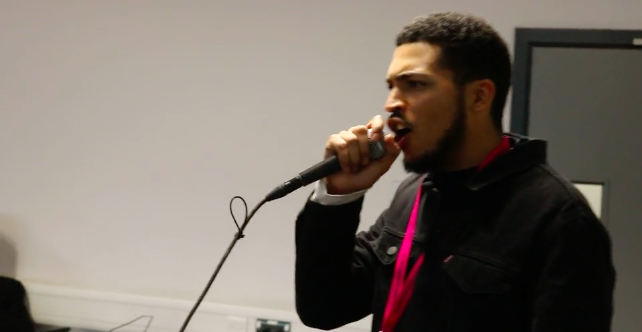 Students watched a performance from local superstar Eyez and VIP’s Max Wheeler, and then received a workshop on how to create their own tracks using VIP Studio Sessions. The number of tracks made by students has doubled since our visit, so it looks as though some students have been inspired to enter our Local Heroes competition! “KS3 students absolutely loved the Grime tour – it’s a shame we didn’t have longer! Students were gathered around right, left and centre to meet Eyez and enjoyed watching his and Max’s impromptu performance at break time. Since the Grime tour, all year 7’s and 8’s have begun their second rotation in Music, which is all based around composing a piece in any style on Charanga. Most students have chosen Grime, Hip Hop and Dubstep with some trying the House, Pop and Afrobeats tutorials. I heard one of my year 8’s say to their friend on their first Charanga lesson, “this is sick, I can’t wait until I go home tonight, I’m going straight on this!”. I have had many students asking me if they can work on their project at break or lunchtime. I have promoted the Derby Local Heroes competition with all of them, so at the end of each half term we shall be submitting entries from Merrill! The students are very excited to be part of something bigger. They also want ‘Merrill’ to feature on the next VIP studios track by Eyez. If you would like to find out more about VIP Studio Sessions contact: melindarobson@charanga.com, or start a free 30 day trial here.